Jesus Christ, That’s a Big Statue! 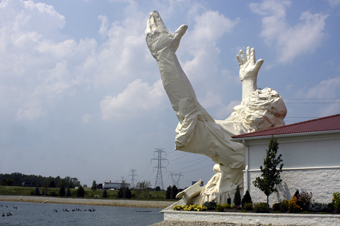 Solid Rock Church seems a fitting name for a house of worship home to a colossal sculpture of Jesus—despite the fact that the sculpture is actually made out of plastic foam and fiberglass stretched over a metal frame. 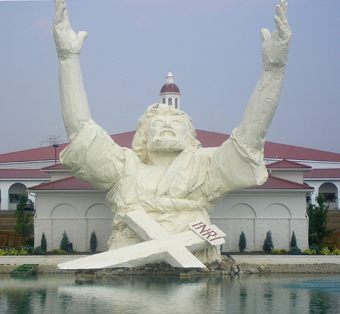 The huge Christ, which was completed in September 2004, looms over the baptismal pool outside the church founded by evangelist Darlene Bishop and her husband Lawrence Bishop. The 62-foot sculpture depicting Jesus’ head and torso has a 42-foot span between its upraised hands (leading some locals to refer to him as the “Touchdown Jesus”) and a 40-foot cross at the base. Rendered by artist James Lynch at the request of the Bishops, the statue serves as advertising for the 3,000-member nondenominational church and as a subject of controversy in the community. The Stories on this site are just the tip of the iceberg. 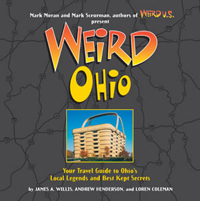 Buy Weird Ohio today!